Tom Kitwood understood this idea well, calling it Personhood; “it implies recognition, respect and trust” (Kitwood, 1997). Personhood can be massively undermined when people are not considered according to their individual needs. By treating the people in our care as patients and tasks, we can easily lose the recognition, respect and trust we all deserve. The real challenge is how we put this into practice. 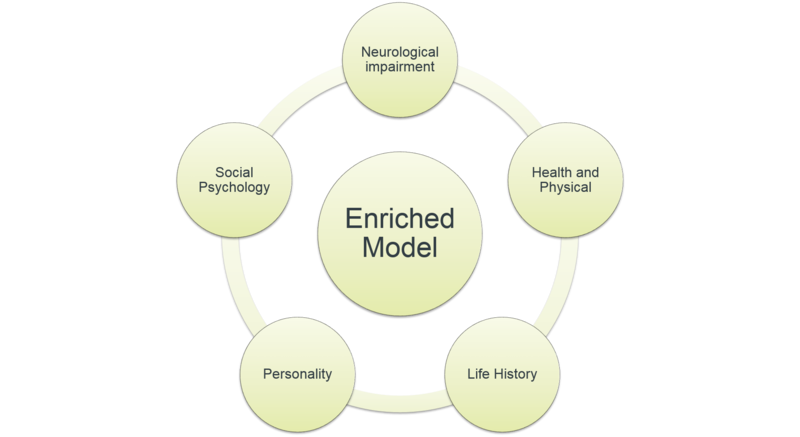 Kitwood came up with a model to help us think outside the “task” and the “patient” and give more positive experiences to the people we are caring for . This includes the decline of cognitive abilities that comes with dementia – memory loss, slower processing, language difficulties, loss of abstract thinking, reduced planning and sequencing, behaviour, and more! A person with dementia may also have other illness, temporary or long standing, which will impact their functional ability and how they are experiencing their time in our care. These may include pain, sensory impairments, chest infections, UTIs, wounds or trauma, pressure ulcers, long term conditions (diabetes/blood pressure or heart conditions), and mental state. It’s so important to know if the person you are caring for has more than a dementia diagnosis – how else will you be able to understand how they may be feeling? A key way in which we make sense of the ‘here and now’ is through reference to past experience. This doesn’t change for somebody with dementia. It gives us an idea of how they might perceive a current situation. Talk to them, talk to their family, use the “This is Me” or “Life History” documents to try and find out about the person under your care. People and their experiences are moulded by their sense of self, relationships, interactions and the environment. Our relationship and interactions with the people we are caring for have the potential to be extremely positive or extremely damaging. Considering the whole picture and knowing the person will make all the difference to our relationships and the way we interact with them. So, how do we treat our patients more like people? In the same ways we do with other people! We get to know them, respect them, recognise them as a person and we trust them. We do all we can to enable the abilities they hold, and we interact in positive ways when assisting them with the abilities they have lost. A person is more than their dementia diagnosis. Lets keep hold of who they are and ensure their care is the best we can provide! A person is more than their dementia diagnosis.